Passion and fetish of every woman, the bags are never too many. Classic style handbags or those more modern and original, each one of them will allow you to bring everything you need without sacrificing style. Choose high quality leather, trendy colors and evergreen models and you will always be impeccable, in the office as to the aperitif. 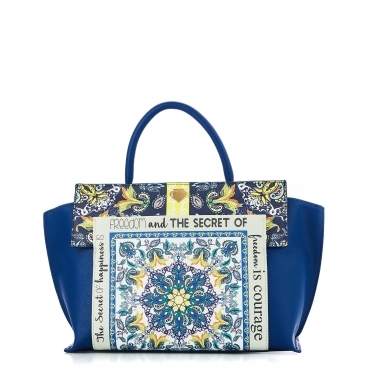 Are chic and elegant, sober and yet trendy: the handbag have always been the passpartout bags of feminine wardrobes. Clean and decided lines, neutral colors, the pastel tones are perfect for a bon ton look, combined with an equally sober coat. If instead you want to dare, choose a handbag with the lively colors, a passion red or pink or still a metallized tones that spiccherà on most classic black coats giving a character more decided to your look. The handbags are particularly indicated for the day: in the office, for dealing with matters in the city or for your free time. They allow you have everything you need. Use it also to face a trip, an informal evening or an important appointment. Choose an envelope or pochette model for the evening, those with handles or a shoulder strap for the day: just change a small detail and your bag can accompany you in different situations by letting you always appear at the top. All handbags that we propose you are made of materials of excellent quality while paying attention to the style: We are confident that you'll love it.